Should you choose All-Clad or Calphalon in your kitchen? Here’s everything you need to know about both brands. Cookware is a pretty important part of your kitchen. Without cookware, you can’t fry bacon, scramble eggs, or boil pasta. You want your cookware to last a long time, clean easily after each use, and transfer heat easily to your food. Because of this, people often spend a lot of time and money finding the best cookware for their kitchens. When it comes to cookware brands, All-Clad is perhaps the most talked about and well-known. 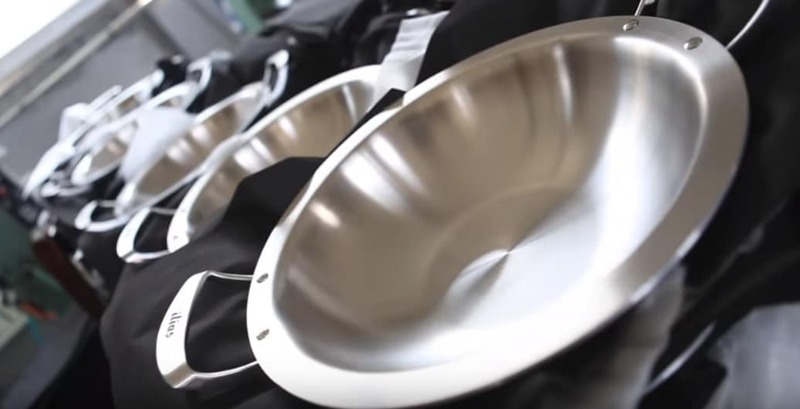 Their innovation in bonding multiple layers of metal together revolutionized the cookware market and brought a variety of new products to the table. While All-Clad is best known for their multi-ply products, Calphalon was one of the first brands to bring hard-anodized aluminum to the table. This method of treating aluminum increases its strength and durability. The resulting anodized cookware is light, strong and lasts for many years. Today, both brands offer cookware in a variety of styles. You can get stainless steel, ceramic, and Teflon-style non-stick products from both Calphalon and All-Clad. You can even get hard-anodized All-Clad cookware or multi-ply Calphalon cookware. While the products are often quite similar, there are a few important differences between them. The biggest difference, however, is simply the brand. All-Clad pots and pans have All-Clad branding, while Calphalon pans don’t. This doesn’t matter if you never show your pots and pans to anyone else. If you have dinner guests that are impressed by All-Clad, however, you might prefer to get cookware that will show off its more prestigious branding. The biggest similarity involves the manufacturer’s warranty offered by both companies. Both All-Clad and Calphalon offer a full, limited lifetime warranty on most products. This means that both companies are confident in how their products hold up over a long timescale. All-Clad is thought by some to have some of the best workmanship around. In practice, however, you might have trouble spotting differences between an All-Clad pot or pan and a similar Calphalon one. With either brand, an all-metal cookware piece will last you for many, many years with proper care. On the other hand, non-stick pieces from both brands will have a shorter lifespan of around three years, depending on the specific coating and how you care for it. 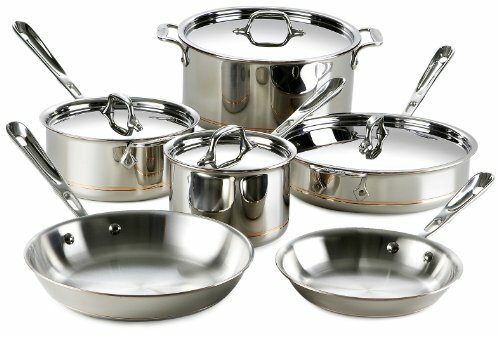 All-Clad pieces and sets tend to be fairly pricey, while Calphalon is usually a bit more affordable. Despite this, All-Clad is more than worth the cost. This is because cookware tends to last for a really long time. If you think that buying an All-Clad set or piece will help you have more fun in the kitchen or make you cook more often, the increased cost is easily justified over the multi-year lifespan of your cookware. It’s not uncommon for All-Clad cookware to last for several decades. Of course, Calphalon pieces can last for a long time, too, especially the stainless steel options. Longevity isn’t an All-Clad exclusive! Like I said before, Calphalon makes some lines that are very similar to the ones offered by All-Clad. Their Tri-Ply stainless line is nearly identical to All-Clad’s signature products. The truth is that the Calphalon pots and pans are really, really similar. You won’t notice a big difference between them and All-Clad if you simply cover the branding. Both lines perform very similarly in the kitchen and will hold up very well with repeated use. With that said, Calphalon seems to have slightly worse quality control than All-Clad. This means you’re a bit more likely to have to contact customer service within the first couple of weeks of use. This is the biggest difference between All-Clad vs Calphalon stainless steel cookware. There’s also some difference in regards to weight and the exact construction details, but again, the pots and pans don’t cook any differently. You’ll make the same food on either brand. Available in both 7, 10, and 14-piece styles, this cookware set is the ultimate choice when you go with All-Clad. It makes use of the brand’s signature multi-ply construction in a unique way that delivers some pretty big upsides in the kitchen. Copper is a great material to use in cookware. This is because it distributes heat really, really well. It’s much more thermally conductive than aluminum, in fact, so it’s the best choice when you want cookware that heats up evenly and quickly when you turn on the heat and cools off just as fast when you turn the heat down. Unfortunately, copper is heavy, delicate, and expensive. All-Clad has solved this problem with this cookware line by encasing a layer of copper with other metals. The copper is covered with both aluminum (for strength and light-weight without sacrificing heat distribution) and stainless steel (to form a safe, non-reactive exterior that’s easy to clean). This multi-ply bonded construction is the very technology that made All-Clad famous in the first place. After many years of perfecting this method of making cookware, All-Clad has totally mastered it. This cookware set is pretty pricey, but it’s got the best possible set of features you could ask for. It’s oven safe to a ridiculously high temperature (600 F), it’s totally dishwasher safe, and it’s not non-stick. This means that you’ll have to use a bit of care while you cook, but it also means that this cookware set can easily last you for the rest of your life. In other words, you’ll spend a lot of money now, but you’ll save a lot of money by not having to buy cookware for a very long time. If you want the ultimate All-Clad cookware set, this copper-core set is the best option. It delivers the very best features in a stunning package that will impress your family and friends. If you’re going to get a single piece of All-Clad cookware, I think that this saute pan is a great option. It’s a great in-between option that gives you most of the advantages of a stockpot or a frying pan at the same time. It’s got a big, flat cooking surface and fairly deep sides, meaning you can brown meat, sautee vegetables, or even boil pasta in one pan. 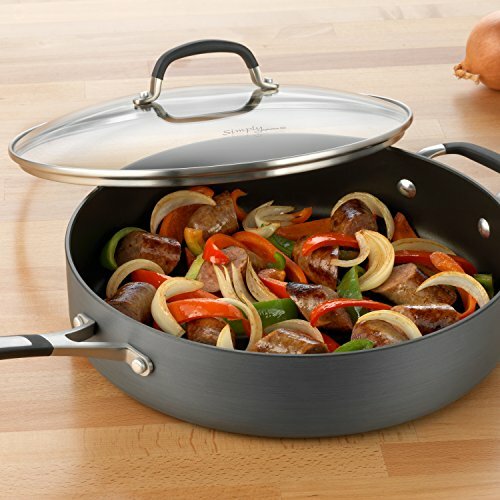 This saute pan utilizes All-Clad’s signature tri-ply bonded construction. It’s got a layer of aluminum sandwiched between two layers of steel, making it light, strong, durable, and very easy to clean. It’s also got excellent heat distribution, although it’s not quite as nice as the copper core set above. All-Clad thinks that you’ll frequently cook dishes with lots of liquid in this pan, so they’ve helpfully included an extra handle opposite the regular long one. This squat bit of metal makes it a lot easier to lift this pan when you’re done simmering your favorite dish. This Calphalon line is most similar to the All-Clad style of construction. 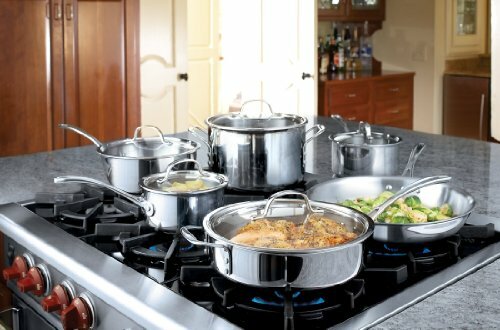 It utilizes a layer of aluminum encapsulated in stainless steel all throughout the pots and pans, not just in the base. This helps distribute heat all the way up the sides of each pot and pan quickly and evenly. The set is dishwasher safe, technically, although Calphalon recommends that you hand-wash instead. The reason is simple: dishwashing will make the pots and pans lose their luster over time. You can combat this by getting a special metal cleaner that will keep your cookware shiny. While stainless steel cookware sets like this one will last practically forever, they’re not as easy to use as non-stick pots and pans. You’ll run into the same set of problems with All-Clad, of course. You can still cook most recipes by managing your heat levels carefully and using plenty of cooking fat. With a bit of practice, you’ll soon be able to cook eggs, chicken, and other “sticky” dishes without needing to break out the Teflon. Every piece in this cookware line performs very well in the kitchen. The pots and pans offer very good heat distribution and seem fairly sturdy, although they do feel a bit light. If you’re looking for a more affordable alternative to All-Clad, you definitely can’t go wrong by choosing this Calphalon cookware set. Just like the All-Clad saute pan above, this pan is a great choice if you’re only looking to buy a single piece. The high volume cooking area lets you cook dishes with lots of liquid while the wide bottom lets you fry eggs, cook pancakes, and brown meats. Unlike the other items on this page, this is a hard-anodized aluminum pan with a traditional Teflon-style non-stick. This pan isn’t going to last you for the rest of your life. Instead, it’ll work great as an egg pan for the next several years. You won’t have to bother managing your heat levels particularly carefully or greasing your pan. Instead, you can just slap your eggs in, turn on the heat, and flip them effortlessly. A stay-cool handle and glass lid make this saute pan an absolute pleasure to use. You can watch your food as it cooks and skip the potholder while you move this pan around. If you want a traditional hard-anodized Calphalon pan or you simply want something to make cooking eggs and other sticky foods a bit easier, this multi-purpose saute pan is a great choice. 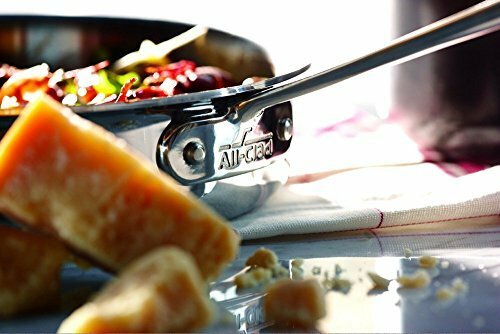 While All-Clad is one of the best-reviewed brands on the market, other cookware manufacturers have caught up. If you’re willing to sacrifice a teeny bit of quality control and get a less prestigious brand, you can often save lots of money and still get a multi-ply cookware set that will last for years. On the other hand, if you want to impress your guests and you don’t mind paying a premium for quality American workmanship, All-Clad remains one of the very best choices. There’s no “right” answer that will fit every kitchen. Instead, you’ll have to choose the right brand based on your needs, priorities, and budget!